Sienna Blake has issues with her body, mostly that there's just too much of it, and she hasn't had a date in forever. To make matters worse, she has a crush on the most perfect, most gorgeous man alive, Logan Drake. As if someone like him would ever take a second look at Sienna! Logan Drake may show up to PR events with a model on his arm, but he's grown tired of the stick thin women who constantly complain about their weight. He wants a real woman! Someone he can take out to eat and she'll actually order a meal instead of a small salad and a glass of water. When fate throws Sienna Blake into his path, he thinks he's finally found someone worth dating. When Sienna and Logan get together, the sparks begin to fly. Just looking at Logan makes Sienna want to do naughty things to him. Never had she had such lascivious thoughts about a man before, but one look at Logan and she beings to drool. "The storyline and the characters are all well written and the interaction between them is realistic. The love scenes are provocative and very steamy! If you wear glasses, keep a tissue nearby to defog them." 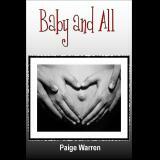 "Paige Warren has created a short story that is sure to turn you on and keep you wondering how it will end. With her hot love scenes, romantic tale, and believable characters, you will not be disappointed..."
"Not only would I be willing to read this story again, I intend to do so, several times. This is one of those books that will forever stay in the "To Be Read" file."